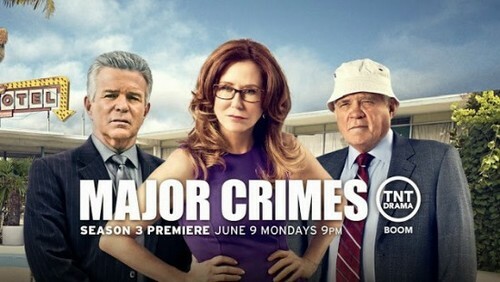 Tonight on TLC Major Crimes premieres with its third season. On tonight’s episode “Flight Risk”, family secrets surface when a father and his two children go missing in the Season 3 opener. Also: Trust issues come into play when Rusty takes suspicious trips on his own. For those of you who are new to Major Crimes, the show is a successor spin-off of The Closer; it follows the departure of Deputy Chief Brenda Leigh Johnson from the LAPD, Captain Sharon Raydor (McDonnell) is selected as the new head of its fictional Major Crimes Division. On tonight’s episode when a father and his two young children go missing, the squad has to work quickly to find them, while uncovering a slew of terrible family secrets along the way. Meanwhile, Raydor does her best to trust Rusty as he begins to take suspicious trips out on his own. Kathe Mazur guest stars. Tonight’s episode of Major Crimes kicks off with Sanchez briefing Lt. Provenza on a missing person’s case. The wife reported that her husband is MIA with their two children. Provenza and Sykes are investigating the homes for any clues. Lt. Tao finds traces of blood all over the daughter Elly’s bedroom. Sharon and Lt. Flynn question the mother Cynthia Logan, of the children at the police station. She was out of town and received a call from her mother that her husband Ben and her children Owen and Elly were not at home and their breakfast was still on the kitchen table, untouched. Sharon explains to Mrs. Logan that they can’t open a missing persons case because it hasn’t been 72 hours. They don’t bother to tell her that someone cleaned blood out of her daughter’s room with bleach. Tao gets a warrant to go through the couple’s finances and her husband’s cell phone. They learn that he was in contact with a divorce attorney, which is odd because according to Cynthia their marriage was perfect. Sykes heads off to the airline where Ben was a pilot to search for clues to the disappearance. According to the airline, Ben never showed up for work today, and didn’t bother to call in. Rusty arrives at the station with a bouquet of flowers that was delivered for Sykes. Provenza and his team access surveillance tapes from the hotel where Cynthia Logan was and her story checks out. However, Sykes returns from Ben’s airline and reveals that he has been flying some shady customers south of the border and pocketing boatloads of cash for his work. Flynn and Sharon sit down with Cynthia Logan, they alert her that her husband had an appointment with a divorce lawyer and she is shocked, she insists that it can’t be true. Tao, Sanchez, and Provenza find the Logan children’s suitcases next to the airline runway. They are shocked to find the two children dead and stuffed in to the suitcases. The coroner reveals that the children died via carbon monoxide poisoning. Sharon and Flynn insist that the team not reveal to Cynthia that her children are dead yet. The major crimes unit pulls surveillance tapes from the airport and learns that the car that dropped the children’s bodies was a red Chevy Malibu. They also run blood tests and are shocked to see that Cynthia’s daughter Elly was not her husband’s daughter, Cynthia had an affair. And, they believe the blood found in Elly’s bedroom was actually her father Ben’s blood and not her’s. Flynn and Sharon take Cynthia back in to the interrogation room, she admits she had an affair but claims it was years ago and a mistake. They also reveal that they tracked down the red Chevy Malibu, and they know that she bought it for another man. Cynthia breaks down and says that the red car is at the police station parked in the visitor’s section and the guys she had an affair with is in the waiting room. The father of her daughter is her cousin Tim. Sykes and Provenza take Cynthia’s cousin Tim in to the interrogation room next. Tim revealed that the night before Ben and his children went missing he told Ben the truth about his affair with Cynthia. Tao and Sanchez search Tim’s car in the parking lot and find that he drilled a hole in his exhaust and connected a hose to the trunk. Sanchez storms in to the interrogation room screaming at Tom for murdering Elly and Owen. They cut a deal with Tim and tell him they will not put him up for the death penalty if he tells them where he left Ben’s body. Tim breaks down and begins confessing; he says he never wanted to kill the kids, they were supposed to be at camp. He admits to killing Ben and says he buried his body in the backyard. Sharon heads back in to the room with Cynthia and her family and breaks the news to her that her children and husband Ben are dead. Sharon feels terrible that she suspected Cynthia of killing her own children and kept the news that they had passed away from her. Rusty shows up and says he needs to talk to Provenza privately. He reveals that he is in contact with his birth mother again and he went to see her; he makes Provenza swear not to tell Sharon. His Mom just had dental and gum surgery and she is staying in a rehab, she needs an electric tooth-brush and they cost $60. He doesn’t want to ask Sharon for the money. Provenza agrees to spot him the money, but he tells Rusty he has to tell Sharon the truth.